Ilkeston is included railway services are available from Network Rail’s electronic National Rail Timetable (eNRT) which is a long-term timetable for planners that covers services on the national rail network. 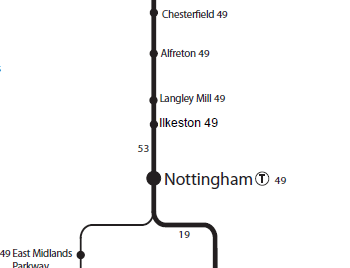 All timetables are split into routes, and so far there are two routes in which trains will stop at Ilkeston. 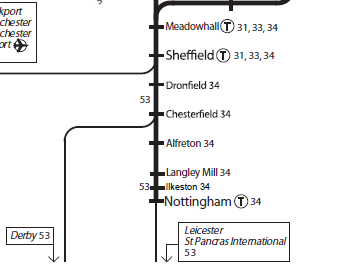 Using the available timetable documents and route maps, it has been established that Ilkeston services (as of Febraury 2017) fall under tables 34 and 49, which correspond to East Midlands Trains and Northern Rail services. Timetables need to balance demand for trains serving small communities and non-stop fast trains as well as the requirements of businesses that rely on freight. Speed limits vary on a length of track – for example, at bends and over points. Because signalling infrastructure varies across the network, what is considered to be the safe distance between trains at one part of the route can differ at another part. There’s a minimum time gap required between trains using the same platform at a station. Stopping, non-stopping and freight trains all travel at different speeds, so a mix of these on the track affects the number of trains that can use that section of track. Trains can’t be scheduled to run too closely together because we need flexibility if there is an incident to get trains back on time. We work hard to avoid knock-on delays. Different schedules are run on bank holidays, so we work closely with the train operators to plan revised timetables. Time for improvement work and routine maintenance needs to be planned in to increase capacity and keep the network running reliably. East Midlands Trains and Northern Rail have yet to publish any public information for passengers but for now, the information below could be correct. The appropriate PDF timetable and route map documents have been download and unzipped from Network Rail’s eNRT page since their webpage is often slow and unstable.